“I don’t take ‘no’ for an answer. I am very persistent […] if it doesn’t work out the first time, I’m going to figure out a way to rework it and try it again,” said 2006 Manor College graduate, Tasha McNerney, in response to her recipe for success. 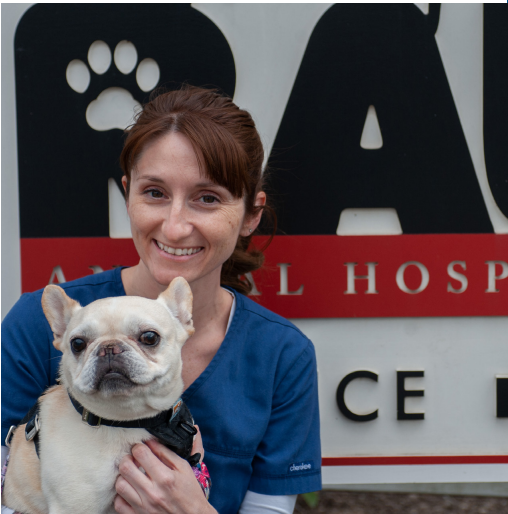 McNerney works at RAU Animal Hospital in Glenside, Pennsylvania. She has been an employee at RAU for 14 years– ever since completing her internship as a veterinary technology student. Today, McNerney is the Operating Room Supervisor. McNerney continued her education at Manor after receiving a Bachelor’s degree in wildlife biology at Michigan State University. McNerney is a veterinary Technician Specialist (VTS) in anesthesia and a Certified Pain Practitioner (CVPP). After getting to know a handful of veterinary professionals involved with anesthesia and pain management, McNerney started connecting with them on Facebook and decided to start a group, Veterinary Anesthesia Nerds. McNerney designated this space for questions and ideas from other veterinary professionals in either fields. She said it started with 10 followers and has since grown to have other 26,000 followers from all across the world. McNerney took advantage of the groups popularity and created a yearly conference; this October marks its third annual. “We have the Veterinary Anesthesia Nerds Symposium that happens in Las Vegas. That’s where speakers, veterinarians, and technicians all come together to talk about anesthesia and pain management,” said McNerney. That is just a taste of the success McNerney references in her initial quote. Interestingly enough, when asked about her proudest career moment so far, Veterinary Anesthesia Nerds was not her top choice. “I feel like if anything, Anesthesia Nerds is cool, but at some point Facebook is going to run its course,” said McNerney. Instead, she brings her personal initiative to officially name September as Animal Pain Awareness Month throughout the veterinary industry. McNerney explains that February is popularly known as Pet Dental Month among her veterinary cohorts so she wanted the same recognition for animal pain management. McNerney decided to take matters into her own hands. She declared September the month she would education people on the importance of animal pain awareness, with hopes that it would catch on. 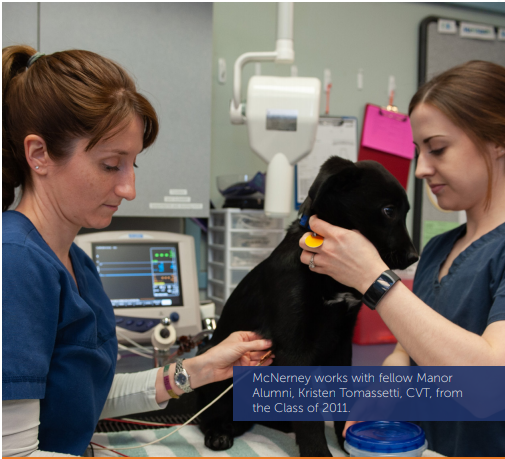 McNerney started her journey of becoming a veterinary technician at a local two-year college before transferring to Manor in her second year. “I ended up looking into the program and I liked the way Manor’s externship program was set up better than the current program I was in. “I felt like there was a lot more flexibility in Manor’s program,” said McNerney. Today she is proud to say, Animal Pain Awareness Month is listed as September on the American Veterinary Medicine Association’s website. While McNerney’s externship days are long behind her, today she spends much of her time being a mentor to others. McNerney got involved with lecturing at conferences through her colleagues and has been traveling for speaking engagements since 2011. Her world is currently consumed by lecturing, teaching, consulting, and of course, her anesthesia job at RAU. She adds, “RAU is really my meat and potatoes job, and I love it there. Then I do everything else as a side to that.” Her major side project at the moment is making preparations for the upcoming Veterinary Anesthesia Nerds Symposium.